Popular giveaways include tech products, car cups, office supplies and insulated wine glasses. For giveaways that will be shipped, consider this T-shirt that is pre-packaged for mailing. Your company has decided to rent a booth at an upcoming trade show. Before you make reservations and pack your bags, here are some tips from trade show experts on what you will need on the show floor and how to maximize your time in the booth, land solid sales leads and create your follow-up strategy. After you’ve chosen the right show based on who is expected to be there — customers/prospects, vendors and competitors — pre-show communications, whether electronic or snail mail, will ensure others know you will be there and what you will be showcasing. You may also choose to get the word out via social media. Tim Patterson, whose company TradeshowGuy Exhibits helps businesses create trade show marketing and exhibiting strategies, suggests that social media can be used most effectively to build buzz seven to 10 days before the show. You may use Twitter or Instagram, for example, to let potential show attendees know what products you will have on hand, if there will be demos or even to show the venue itself or interesting nearby attractions. Be sure to use the show’s official hashtag so that your posts and tweets will be picked up in show-related searches. Typically, you send sales and/or marketing staff to represent your company at the show. Will they simply plant themselves at the booth and wait for potential leads to walk up? That’s not an effective plan, according to Ruth Stevens of eMarketing Strategy. “I urge people to book appointments in advance, because every minute you are at the show, whether it’s on the show floor or walking around or going to parties at night, that’s an opportunity to have a conversation with a customer or prospect,” she said. Communicating with the show organizer is also key. What is the range of booth sizes? Does the organizer provide tables, signage, wi-fi, digital show badge technology? Is there other equipment for rent, or should you bring your own? Who, demographically speaking, does the show usually draw? When packing for the show, remember to bring extra business cards and copies of all the show paperwork (booth number, contract, set-up instructions and so on). If the show has a prize program, bring a plastic fishbowl or other container for business cards. “Giveaways are important, but I think that they really need to be appropriate,” Patterson said. When planning to keep your brand in your customers’ minds, determine if the item is useful. Is it something they will see regularly to remind them of your company? 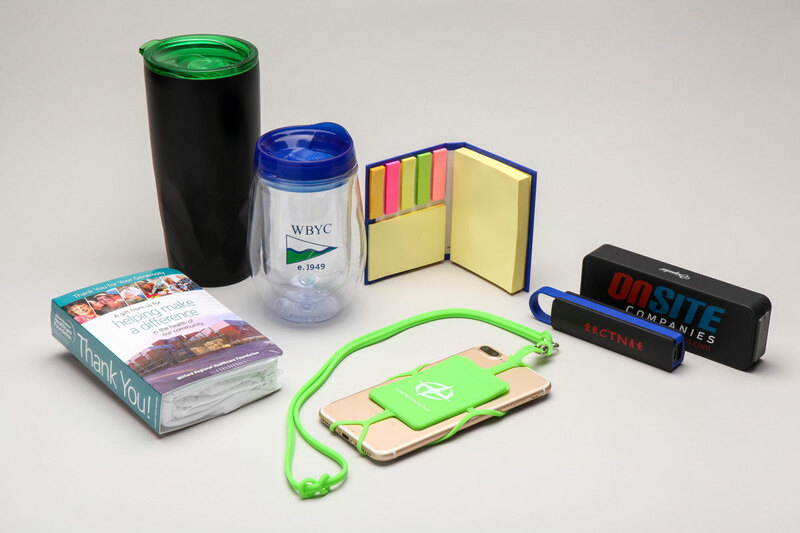 Whether you plan on offering branded coffee mugs, flash drives or tote bags, consider ahead of time what swag your team will pack. How you set up your space can make a real difference in your interactions with attendees. If you’ve rented or brought a table, think about where you will place it. “I always suggest that you put it on the side of the booth and have the booth open, so that people can walk into the space and talk to you,” Patterson advised. Never underestimate the attraction of food, drinks and candy. For example, at the 2018 GAWDA AC, vendors brought treats ranging from donuts to 50-year-old scotch for sampling to an actual coffee shop, including a trained barista! Needless to say, these were very popular suppliers at the Contact Booth Program. Once you have attracted your customers, the booth conversations, experts agreed, are the single most important reason for going to the show in the first place. “The value of a trade show is the chance to have a face-to-face conversation with actual, real people, and to kick off a business relationship and to probe about their needs and their issues,” Stevens emphasized. Making those chats easier means configuring your space to be open and inviting. Patterson warns exhibitors against certain booth behaviors that are turn-offs. Body language is one important factor in making a potential client feel comfortable. “You know, if you’ve got your arms closed, you’re basically saying to people ‘I’m not interested.’” He suggests that booth staffers make eye contact, smile and keep their phones out of sight. “Being on the phone, of course, means that whoever you’re on the phone with is more important than being there.” He also discourages exhibitors from eating in the booth. As soon as possible after the show, scoop those business cards from the bottom of your briefcase and input the data into a spreadsheet. You don’t have to use complicated database software, according to Patterson. He uses Excel spreadsheets because he says the program is straightforward and easily searchable. With each entry, include information that will provide anyone reading it with a profile of the person you spoke with at the show that can be used to qualify what type of sales lead she/he may be, now or in the future. Stevens advocates following up as soon as possible after the show. “I would say if you do follow up in 24 hours or within a few days, you’re going to be killing your competition,” she advised. Meadows’ timeline for follow-up is one week after the show, after an initial post-show email. Patterson’s idea for follow-up communications is dependent on the trade show face-to-face. “I think that the follow-up needs to be based on what the conversation with the prospect is,” he said. Above all, he suggests that whoever attends the trade show communicate clearly to the sales team the specifics of what was discussed and when the agreed-upon follow-up call or email or mailed materials should happen.